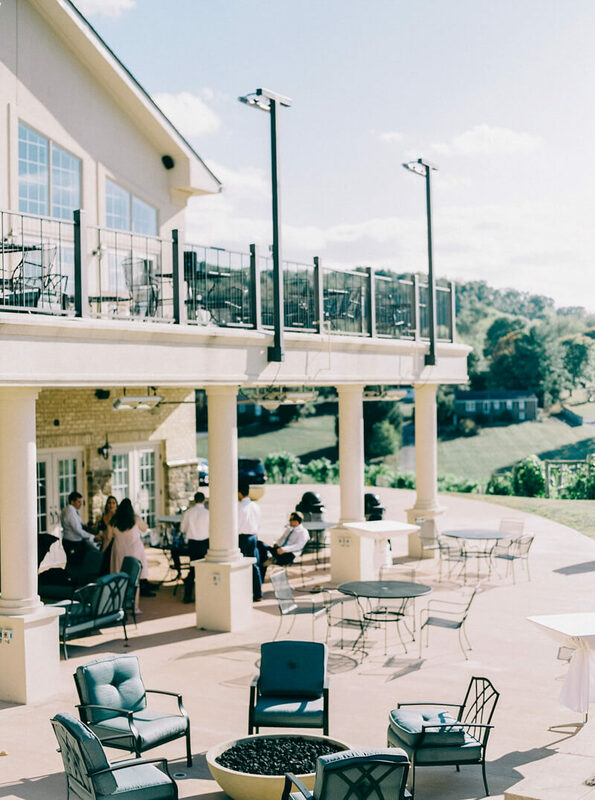 Bluestone Vineyard Wedding. 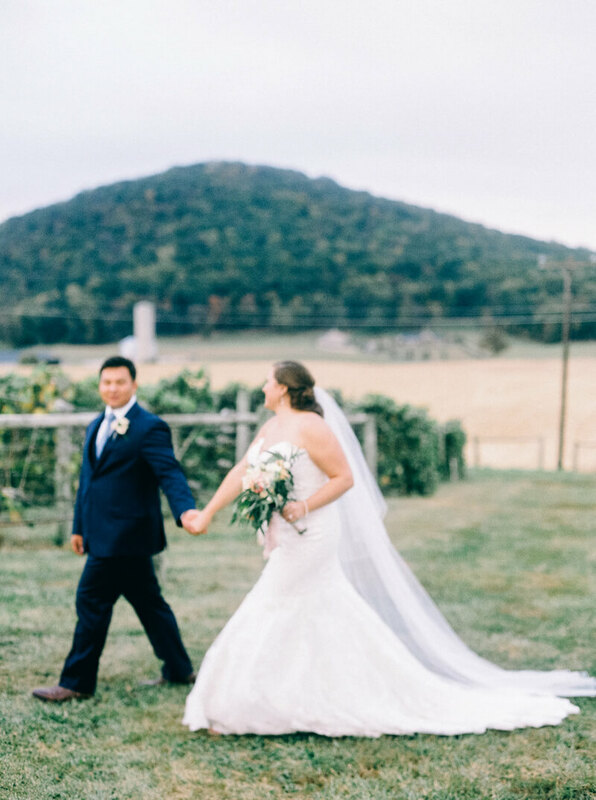 Afton and Matt were wed literally within the vines of the Bluestone Vineyard in Bridgewater, Va. Their special day consisted of blush hues, hand-painted signage and a fresh pop of greenery in every twist and turn. Afton chose a strapless lace fit-and-flare gown that echoed classic bridal style. She accompanied her gown with a long veil and statement earrings. Her bridesmaids wore a variety of dresses in various styles and shapes but all had cohesive art deco inspired details. Matt looked handsome in a navy blue tuxedo with a light blue tie, to which his groomsmen also matched. Afton and Matt chose to have a first look moment before the ceremony. With his eyes covered, Afton approached Matt from behind, to which he spun around and embraced his soon-to-be-wife. 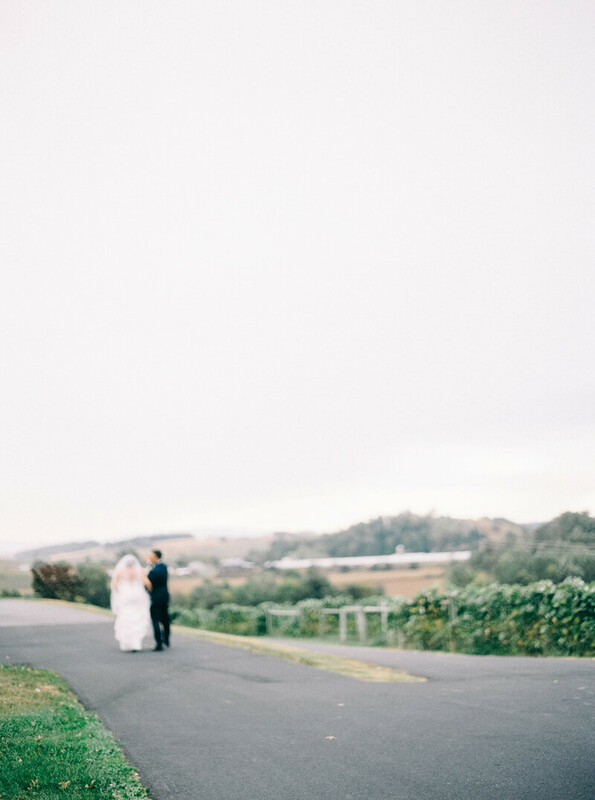 They enjoyed a stroll through the vineyard before the ceremony began. 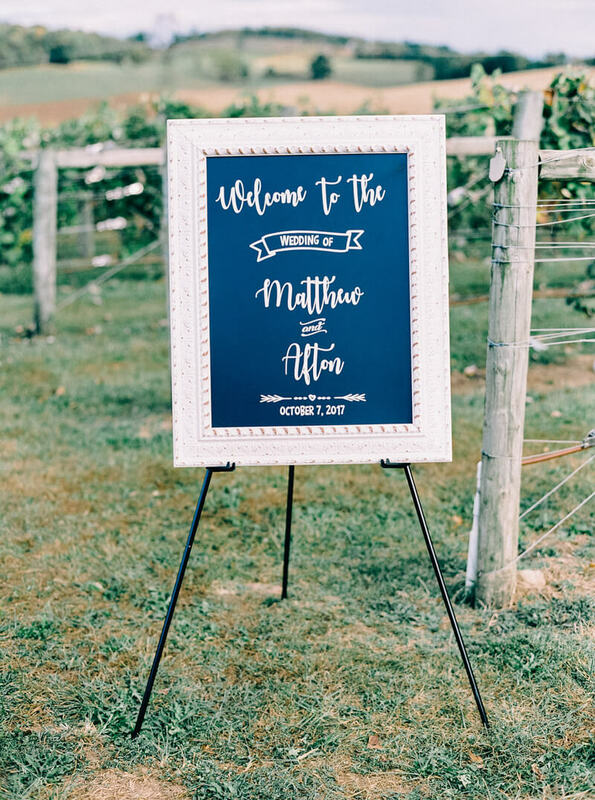 Guests were greeted by a personalized sign as they entered the couple’s vineyard ceremony. A simple but lovely set-up featuring white chairs, eucalyptus nosegays and a floral-adorned arbor set the scene. Afton was escorted between the vines to her awaiting groom. Before family and friends, the couple made their promises to one another and sealed their vows with a kiss. After the ceremony, the entire bridal party took photos in the midst of the verdant vines. 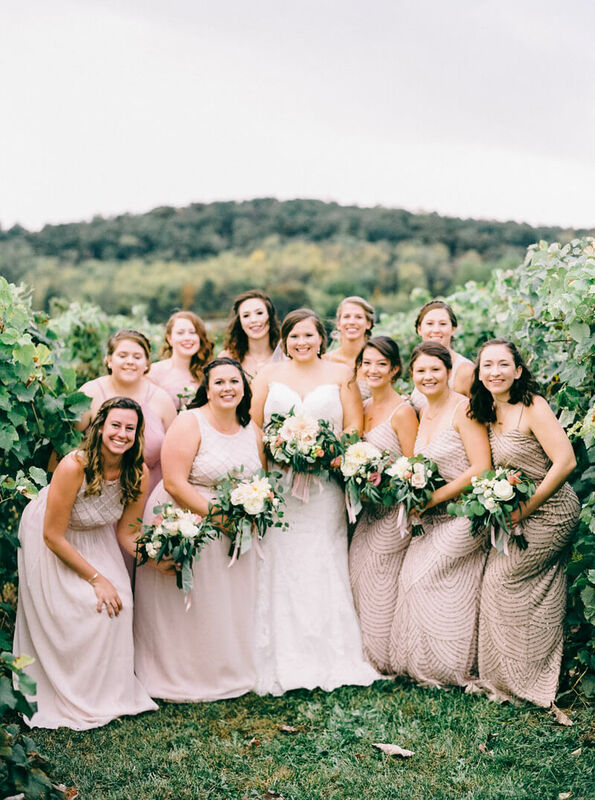 All the ladies’ bouquets teemed with gentle color and elegant greenery, and the gentlemen shared laughs as they walked through the vineyard behind the groom. Matt and Afton stole off for a few more photos as a couple before making their way to the indoor reception at the vineyard’s new Meeting House. An elegant clothespin card display was presented on a simple black frame for guests to find their seats. The head table was set up in front of the stone fireplace. Afton and Matt enjoyed the wedding from behind a white and blush-covered table, complete with florals, candlelight and gold geometric accents. The place settings offered a rosy pop of color. The pink fabric runner matched the linen napkins, all displayed with fresh touches of eucalyptus and a floral-inspired menu card. Much like their love for one another, Afton and Matt wholeheartedly soaked in the vineyard wedding experience. With refreshing greenery as their inspiration, they incorporated a lively vision into their ceremony and reception that flowed effortlessly from the first look to the last dance. It was as natural and sweet as the grapes growing on the vines.